With the economy paragliding in the winds of uncertainties, challenges are jetted out on all major industries including the rapidly growing outsourcing industry. To be geared up for the upcoming challenges of 2013 is definitely a pressing business need for both the outsourcers and the service providers. 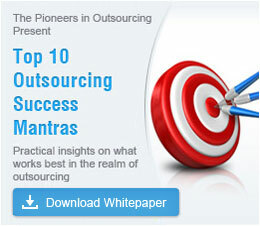 So let's look ahead and see what challenges 2013 may dish out to the outsourcing industry. With an overall shaky economy there is dire need to check and analyze the vendor's financial health and its ability to overcome the rough economic patch for a sustained partnership. Outsourcers should be extremely cautious and follow due diligence while choosing vendors, as small vendors may easily close their businesses if the situation continues to be challenging. NASSCOM predicts slow growth for India IT-BPO Industry in FY 2012-2013 with a lesser growth rate of around 14% with revenues of around US$115 billion in FY 2012-13 compared to revenues of around US$ 101 billion at 15% growth for FY 2011-12. The economic crisis and local political changes may force changes to the outsourcing laws in European and Asian countries. So as outsourcers you need to keep a check on the same and act accordingly. This leads to another challenge, whether to outsource or to near-shore. This primarily rests on two factors: one, to upkeep the national interest and economy by near-shoring, which also has other cultural and geographic advantages; and two, to continue outsourcing and ushering global economic sustenance at cheaper costs and competitiveness, and at the same time embracing economic challenges that the Euro zone and the other Asian economies are facing. Ensuring that your service provider follows green norms for a greener environment is partly your responsibility; you can also mandate them to follow environmental norms to keep your partnership going. One of your challenges is to make your service provider follow these norms and become a true global player. As more and more emerging economies vie for a part of the outsourcing opportunity, the competition mandates them to be more lucrative but with hidden challenges. So exercising extreme care is really important when going for these new service providers. You have to study their work culture, living standards, government policies, tax issues, political stability, work experience, etc., before signing them in. As per the global outsourcing report by Mark M and Dr. Frank, over 30 highly competitive economies will compete for an outsourcing opportunity in the coming two years. It is no longer outsourcing and getting relieved of the task, it's more about understanding, partnering and expanding your business in the service provider's country. This is extremely lucrative and also challenging, but it's a challenge worth taking by partnering with your offshore service providers, who with their nativity edge can help you expand. Some of the key factors driving outsourcing to offshore destinations. Answers and advice on some of the biggest questions customers have regarding outsourcing. Great reasons to outsource market research to India.